Dining out is quite the event in Louisiana, and even more so when the weekend rolls around. Saturday and Sunday mean it’s time for brunch, that decadent meal we enjoy after sleeping in and lingering for hours with Champagne and Bloody Marys. No matter which corner of the state you’re in, there are amazing restaurants hosting epic weekend meals. It’s no surprise that brunch is such a beloved tradition in the Bayou State. While food historians will debate it, the meal was said to have been invented in 19th-century New Orleans by Madame Bégué, who offered a late (11 a.m.) or second breakfast at her family restaurant. In the century and a half since, eateries all across the state have perfected brunch with too-good-to-pass-up drink specials, lively music from local bands, and, of course, indulgent food. The highlight of brunch in Louisiana is first and foremost the food, which can be as simple as a classic breakfast with eggs and bacon or as fanciful as open-faced biscuits smothered with New Orleans-style roast beef. The best brunches are unhurried, with good drinks and good company. Atmosphere is just as important, whether it’s a jazz brunch at a classic New Orleans restaurant or a laid-back meal in Lafayette with Cajun music. Here are six of our favorite spots for brunch that will make your weekends truly special. Each of these restaurants puts a unique spin on Louisiana’s favorite meal that makes for an unforgettable experience. At Jack Daniel’s Bar & Grill at L’Auberge Lake Charles, 2016 Chef to Watch Chef Lyle Broussard amplifies his Southwest Louisiana cooking with local ingredients and making as much as he can in house. That combination makes for an epic Sunday brunch that includes delicious food, customizable Bloody Marys, and live music on an outdoor patio. 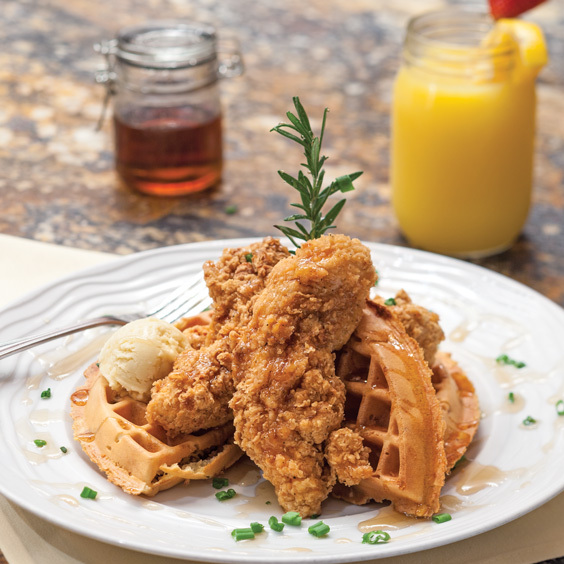 Lyle makes traditional brunch dishes his own by incorporating Louisiana flavors and ingredients. For example, instead of classic Eggs Benedict, Lyle creates two uniquely Cajun versions: Boudin Benedict and Crawfish Benedict. The Boudin Benedict is served with tasso hollandaise, while the Crawfish Benedict is served with house-made green onion sausage and crawfish hollandaise. Additionally, both are served with French bread rather than English muffins. Lyle lends regional flavor to his chicken and waffles dish with the addition of an Abita Root Beer reduction. Brunch isn’t complete without a beverage, and Jack Daniel’s Bar & Grill offers endless options for the ultimate Bloody Mary, such as smoked oysters, beef straws, pickled Brussels sprouts, jumbo shrimp, candied bacon, and more. Photo courtesy of Overpass Merchant. 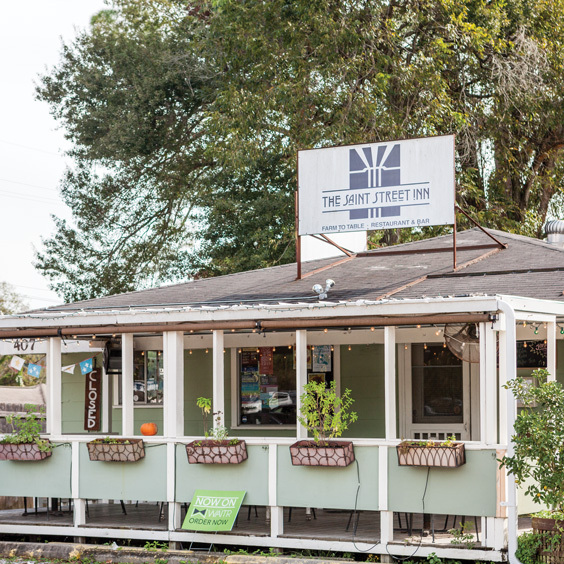 When Nick Hufft and Lon Marchand opened The Overpass Merchant in the former Zee Zee Gardens building in Baton Rouge, they wanted the restaurant to remain true to the neighborhood. With that in mind, the duo created a space where customers could enjoy affordable, high-quality food and drinks with friends. Nick says that although there are some big plates on the menu, the majority of it focuses on smaller, shareable plates. “It’s really important for us, being that it is such a neighborhood establishment, that we wanted everybody to interact,” he says. 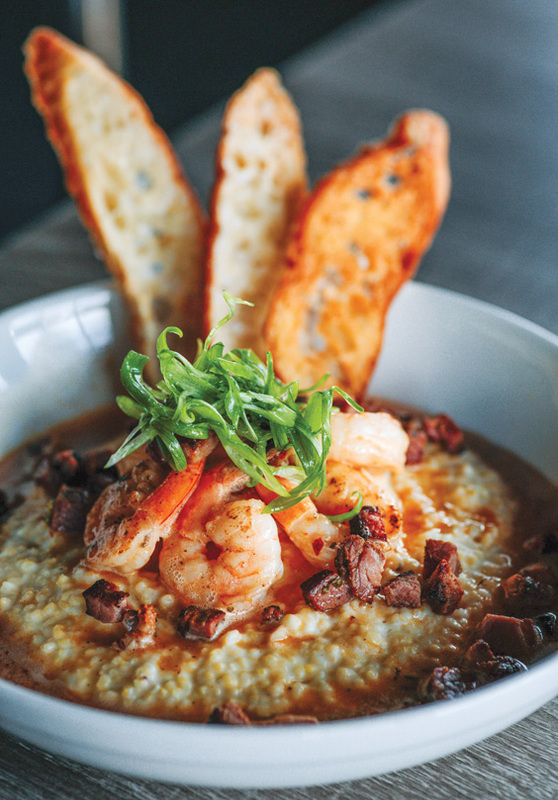 For Sunday brunch, The Overpass Merchant offers traditional brunch items like shrimp and grits, while also serving the snacks and big plates customers enjoy throughout the rest of the week. That includes cheese curds, crispy Brussels sprouts, and the restaurant’s burger, which includes a blend of ground chuck, brisket, and short rib. “We’re kind of known for that burger at this point,” Nick says. While The Overpass Merchant is known for its snacks and burger, the star of the brunch menu is the biscuit section. “That was something that was really important to me, having a good buttermilk biscuit,” Nick says. The Honey Chicken Cheddar Biscuit is the restaurant’s biggest seller, featuring a fried chicken breast with aged Cheddar and honey butter sandwiched in a buttermilk biscuit. With simple yet stunning food, festive cocktail flights, and live music on the porch every Sunday, brunch at The Saint Street Inn is an event. The farm-to-table restaurant in Lafayette serves brunch on Saturdays and Sundays, but Sundays are especially fun with the addition of local artists performing Cajun, folk, jazz, and more. On Saint Street Inn’s brunch menu, Chef Jackson Nevitt makes familiar foods shine with fresh, local ingredients. Customer favorites include the Scotch Egg with house-made chaurice sausage, Shrimp & Grits, the Local Farm Egg Sandwich, and Fried Chicken & Smoked Oats, as well as standards like the Classic Breakfast with eggs, bacon or sausage, and buttermilk biscuits. Saint Street Inn also offers flights of brunch cocktails, including Bloody Marys and mimosas. Each flight is served on a board with 5-ounce glasses filled with variations of whatever cocktail is being served that day. Bloody Mary flights have come with a variety of infused vodkas, like bacon, horseradish, and basil. When local citrus is in season, mimosa flights showcase grapefruit, oranges, and tangerines. Expect to see seasonal updates to menu items like the waffle and salads, which are refreshed with local produce as it becomes available. Every Sunday morning at Marilynn’s Place in Shreveport, “We have to unlock the door right at 10:00 a.m. to let the stampede in,” says Chef and Owner Robert “Bozz” Baucum of his wildly popular brunch. From 10:00 a.m. to 2:00 p.m., the casual restaurant offers a menu of about 10 hefty, comfortable breakfast and brunch dishes, plus a chef ’s special that changes every weekend. The core menu offers biscuits with andouille gravy, red beans and rice, and shrimp and grits, while the Sunday special could be anything from a shrimp and artichoke strata to chicken fried steak or hash browns topped with smoked pork tenderloin and jalapeño-pecan gravy. “I usually do a kind of wild Sunday special and we sell out of that pretty quick,” Bozz says. 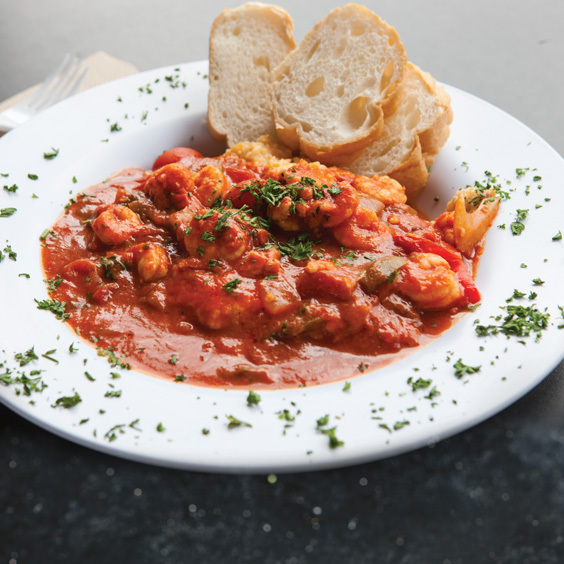 Check out Bozz’s mouthwatering recipe for Shrimp Creole pictured above. If you think the food sounds good, wait until you hear about the drink special. For $15, customers can purchase a “drink ‘til you drown” wristband for unlimited Bloody Marys, screwdrivers, and mimosas. With such appetizing menu options and drink specials, it’s no wonder Marilynn’s Place has a big brunch following. “People come and have fun, eat big food, and have Bloody Marys or screwdrivers or mimosas, and then at two o’clock sharp we turn out the lights and send everybody on their way,” Bozz says. 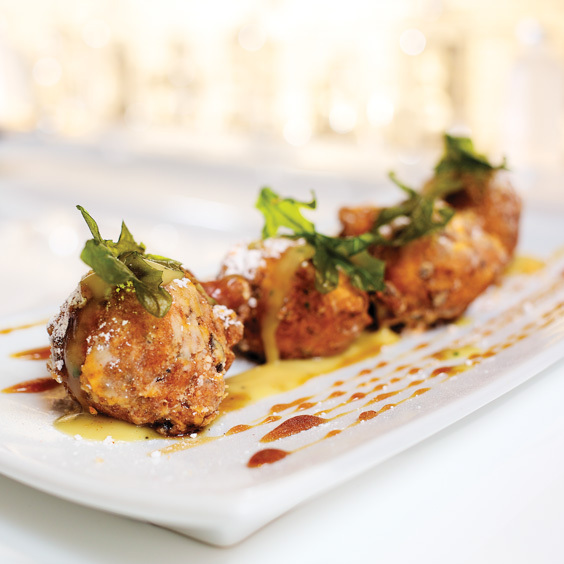 On Sundays in the French Quarter, SoBou hosts one of New Orleans’ most unique brunches. For two hours during Sunday brunch, the latest addition to The Commander’s Family of Restaurants puts on a burlesque brunch called “Legs and Eggs.” A local burlesque performer, Bella Blue, dances around the dining room while a four-piece jazz band plays lively music. The three-course brunch menu consists of appetizers, entrées, and desserts. Although the menu changes every week and seasonally, it always features a dish called “Legs and Eggs,” with a variation of eggs and a “leg” component like soft-shell crab or bourbon-braised pork shank. Other mainstays include steak and eggs and seasonal pancakes, as well as Buttermilk Biscuit Donuts with Smoky Bacon and Cream Cheese Frosting. What’s more, SoBou concocts a special SoBou-zy Brunch Hooch Punch each week, which is served in an oversized flask for the whole table. 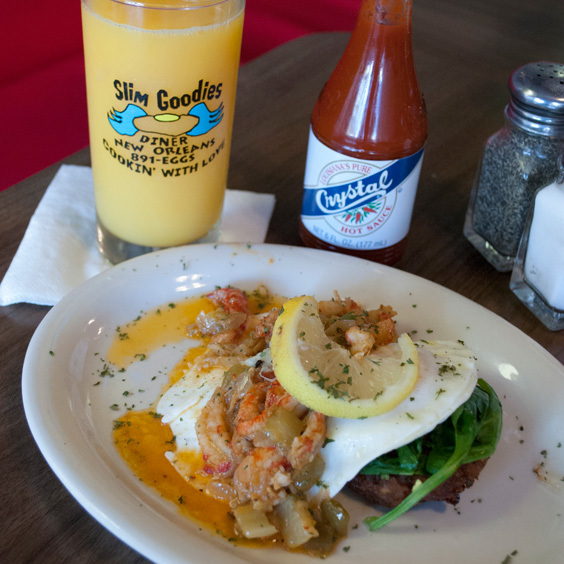 For a casual, one-of-a-kind brunch experience, there’s no place like Slim Goodies Diner, a Garden District restaurant that serves up breakfast and lunch items with a distinctly New Orleans twist. Customer favorites include dishes like the Guatemalan, which includes freshly made salsa with eggs, black beans, fresh avocado, plantains, and tortillas, and the Creole Slammer, which comes with hash browns and eggs topped with crawfish étouffée and served with a biscuit. In addition to their down-home menu, Slim Goodies also offers freshly brewed local coffee, house-made chai, and milkshakes. One of the diner’s popular dishes, the Re-POPulation Combo, came about in the aftermath of Hurricane Katrina. Just 10 days after the storm, Slim Goodies reopened and offered a limited menu.